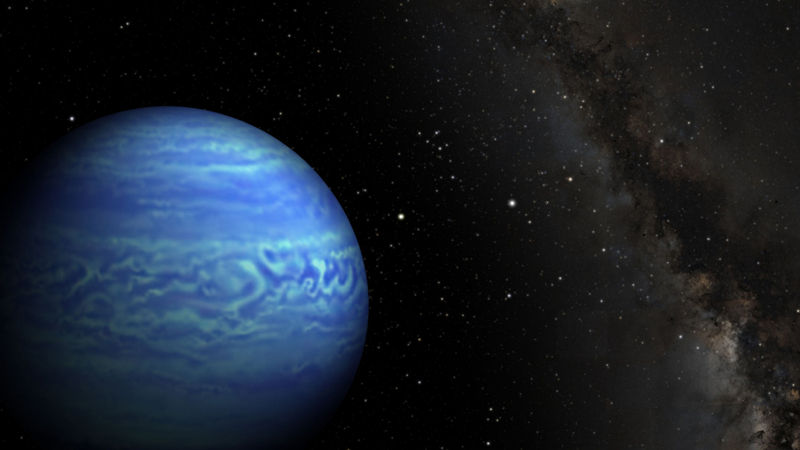 Artist’s conception of WISE J085510.83-071442.5. Credit: NASA. You may have heard about the recent discovery of an ice cold “brown dwarf” or “star” right next door in our Solar Neighborhood. The object, which goes by the telephone number* WISE J085510.83-071442.5, is only 7.2 light-years from our Solar System, making it closer than all but three other star systems, after Alpha Centauri, Barnard’s Star, and Luhman 16. See here for the original NASA story. Both Luhman 16 and our new friend, which goes by WISE 0855-0714 for short, were discovered by NASA’s Wide-field Infrared Survey Explorer (WISE), which scanned the whole sky looking for cold objects that only shine in infrared light. WISE 0855-0714 is the coldest such object ever found at 225-260 K, or -54 to -9 degrees Fahrenheit–roughly the temperature of the North Pole. Unlike the picture about, it would be completely dark to the naked eye. There’s just one problem. WISE 0855-07144 is not, as some news outlets have reported, a “cold star” (sorry, Doctor Who fans), and it is also not, as NASA’s own press release has reported and cold “brown dwarf”. A brown dwarf is in between a star and a planet, but WISE 0855-0714 has been estimated to be between 3 and 10 times the mass of Jupiter, too small to be a brown dwarf. Ladies and gentlemen, this is a planet. So why isn’t it being called a planet? Well, in my experience, it seems as if astronomers are a bit skittish about positively identifying objects like this based on their masses. This is understandable. After all, it’s hard to measure masses accurately in this range, especially for an isolated object like this one. Instead they seem to identify these objects based on what they look like. If they orbit a star, the look like planets, so they’re called planets, even if they’re probably too big. And if they’re free-floating, they look like brown dwarfs, so they’re called brown dwarfs, even if they’re probably too small. This also gets into the problem of how you define what a planet is, in particular regarding whether it’s orbiting a star or not. Hopefully, we can reach a clearer consensus in the coming years. This entry was posted in Current events, Planets and tagged brown dwarf, definition of a planet, exoplanets, nasa, wise, wise 0855-0714. Bookmark the permalink.